There are lots of different projects happening in the shop these days. I delivered this really slick looking touring bike to Ryan. It is built around 26 inch wheels with a Shimano slx group. It has an Alfine Dynamo hub which will deliver power to various devices with help from the E-WERK charging station. The first major tour for this bike will be a 5 week trip through the Andes. This is a beautiful fillet brazed touring frame I built for Yan. I don’t do a huge number of brazed frames these days. The first 50 or so True North frames were all brazed. This was an enjoyable build and it looks fantastic. These titanium stoker stems were made for a customer that has a number of different tandems. The multiple lengths allow him to fine tune the stoker position for different riders. Derek will be finishing off the rest of this build at home. Titanium 29er frame built with an EBB for single speed or geared use. 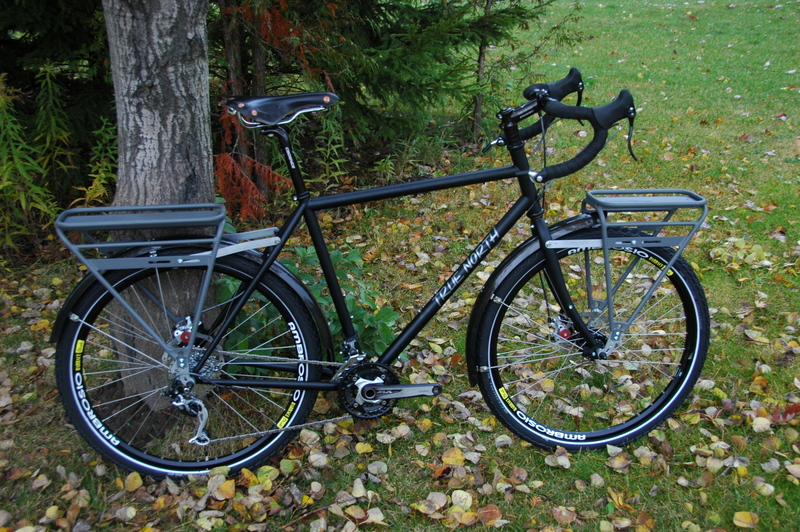 This frame has all of the braze-ons to turn it into an expedition touring bike. The wheels have Chris King hubs built to Stan’s Notubes rims. The rims were clear coated with a tiny bit of white pearl. They should pop in the sunlight. More pictures of these projects can be found in our flickr album.